Disclosure: This blog contains graphic images, viewer discretion is advised. As noted in the first blog of the stones, the meaning of the stones used to create The New City holds within them a mystery of Revelation which was discovered while crushing the stones. This mystery will change history and religion as we current understand them related to Revelation, it is history in the making! Please note that in ancient times stones were classified differently than today and were not a separated family with different names as we see today. Oddly enough, when I started working with the stones, they were taken at their face value and what I knew the stones to be. For instance, I had no clue that a red sapphire was actually a ruby or that an emerald can be red. Since that time, I have learned very much about these gems but still feel I have a lot more to learn. Even published information about some of these stones is wrong. Research is ongoing about the stones, their dates of origin, name origins, when and/or if they became classified as separates from their original families due to color or other contributing factors. Sapphire is a stone which has many separations as you will see in the Jacinth blog. Once all blogs have been written it will become clear that the current classifications are what ultimately changed the meaning. Sapphire is corundum and is now (in modern times) the non-red variety of corundum, the second hardest natural mineral known to mankind. I have not been able to distinguish when in time the color separation of corundum occurred other than the given name was used in the 19th century, and when the red sapphire became classified differently from the corundum family. The red variety of corundum is Ruby – all other colors became called sapphire, even pink. Corundum in all colors is known as sapphire except the medium to dark red tones which in modern times characterize ruby. Sapphire is commonly known as blue yet colors which make up this family of mineral, when applied correctly include yellow, brown, green, black, purple, orange, pink, colorless, and ranges within those colors. Although this blog is about RED Sapphire or Ruby and it is worth mentioning the stone Jacinth was Hyacinth in ancient times, which is today’s blue Sapphire. The Revelation Painting requires gemstones to be crushed into shards including rough and faceted where appraisals were not obtained beforehand. I do not know if the rough gems I crushed where in fact worth $425,000.00 per carat or not. It sounds ludicrous but the message of the painting in my eyes is worth far more than a monetary value. A simple personal philosophy is that I cannot take this painting when I leave the earth, but I can take the impact it made upon the world! Click the rough rubies to connect to a site where scientist have created filtered drinking straws; A new straw that purifies water as it is drunk, is hoped to be part of a solution to water-borne disease killing thousands in developing countries. It is priced at around $3.50 (£1.85) a straw. Each one will last for around 700 litres, around six months to a year. Forgery and thievery is nearly expected when it comes to gemstones due to their incredible value at such small size. Some faceted stones from Thailand and other Asian countries have been known to be lead glass filled which is considered “enhanced or treated”. Even a trained and veteran gemologists cannot tell the difference and requires a high-powered microscope. Although still ruby, flawed, it is a process where the natural feathering or flaws within the stone is lead glass filled which eliminates the flaw and adds weight to the stone. Sellers are supposed to disclose this process but do not readily do so. The stone after time returns to its flawed state. In the painting, although thousands of dollars worth of rubies were used, some were “enhanced”. Britain conquered Burma over a period of 62 years (1824-1886) and incorporated it into its Indian Empire. Burma was administered as a province of India until 1937 when it became a separate, self-governing colony; independence from the Commonwealth was attained in 1948. Gen. NE WIN dominated the government from 1962 to 1988, first as military ruler, then as self-appointed president, and later as political kingpin. Despite multiparty legislative elections in 1990 that resulted in the main opposition party – the National League for Democracy (NLD) – winning a landslide victory, the ruling junta refused to hand over power. 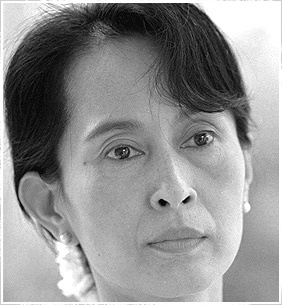 NLD leader and Nobel Peace Prize recipient AUNG SAN SUU KYI, who was under house arrest from 1989 to 1995 and 2000 to 2002, was imprisoned in May 2003 and is currently under house arrest. In December 2004, the junta announced it was extending her detention for at least an additional year. Her supporters, as well as all those who promote democracy and improved human rights, are routinely harassed or jailed. One would imagine in a land which supplies the affluent and elite with their jewels that this country would be one of the “richest” in the entire world! Burma is a resource-rich country that suffers from government controls, inefficient economic policies, and abject rural poverty. The junta took steps in the early 1990s to liberalize the economy after decades of failure under the “Burmese Way to Socialism”, but those efforts have since stalled and some of the liberalization measures have been rescinded. Burma has been unable to achieve monetary or fiscal stability, resulting in an economy that suffers from serious macroeconomic imbalances – including inflation and multiple official exchange rates that overvalue the Burmese kyat. In addition, most overseas development assistance ceased after the junta began to suppress the democracy movement in 1988 and subsequently ignored the results of the 1990 legislative elections. Economic sanctions against Burma by the United States – including a ban on imports of Burmese products and a ban on provision of financial services by US persons in response to the government of Burma’s attack in May 2003 on AUNG SAN SUU KYI and her convoy – further slowed the inflow of foreign exchange. Official statistics are inaccurate. Published statistics on foreign trade are greatly understated because of the size of the black market and unofficial border trade – often estimated to be one to two times the size of the official economy. Though the Burmese government has good economic relations with its neighbors, a better investment climate and an improved political situation are needed to promote foreign investment, exports, and tourism. In February 2003, a major banking crisis hit the country’s 20 private banks, shutting them down and disrupting the economy. As of January 2004, the largest private banks remained moribund, leaving the private sector with little formal access to credit. Within the beauty of the ruby, one might imagine that the sparkle trapped inside comes from tears of the people of Burma. If this is shocking and you did not know this is where your precious rubies and sapphires came from, I am sorry. But now you do know and all I can do is ask you to think before you buy another and for the one(s) you have, when you look deep into the beauty of it, think of it as a crystal ball and see the image below. It is not as beautiful as you think. Consider this: Sell your stones and help the people of Burma rebuild their lives! Afterall, it is just a pretty rock that cost a life. It is not what you have when you leave this earth, it is about what you leave behind. Greenland (Danish: Grønland; Kalaallisut: Kalaallit Nunaat, meaning “Land of the Kalaallit people”) is an autonomous country within the Kingdom of Denmark, located between the Arctic and Atlantic Oceans, east of the Canadian Arctic Archipelago. Though physiographically a part of the continent of North America, Greenland has been politically associated with Europe (specifically Denmark-Norway) for about a millennium. In 1979, Denmark granted home rule to Greenland, with a relationship known in Danish as Rigsfællesskabet (Commonwealth of the Realm), and in 2008 Greenland voted to transfer more competencies to the local government. This became effective the following year, with the Danish royal government remaining in charge only of foreign affairs, security and financial policy, and providing a subsidy of DKK 3.4 billion ($633m), or approximately US$11,300 per Greenlander, annually. Greenland is, by area, the world’s largest island that is not a continent. It is the least densely populated country in the world. The bedrock in the centre of Greenland has been pressed below sea level by the weight of the ice sheet. Greenland is a harsh country filled with cold weather, ice, snow, and harsh conditions. It was discovered centuries ago by the Vikings. Al Gore recently made Greenland more popular, but very few visit this country each year. Of course, Greenland isn’t for weak travelers or those that don’t enjoy freezing to death. If you visit Greenland you will be rewarded with beauty that cannot be compared to anything else in the world, making the harsh travel conditions well worth it. First of all, you don’t visit Greenland expecting luxury hotels or travel accommodations. There are no fancy hotels here, and you would be laughed out of the country if you expected one. Most hotels are just makeshift and are designed to keep you warm and safe from the elements – that’s it. They are practical establishments that only offer the bare necessities. Which isn’t necessarily a bad thing, seeing that these hotels are also rather cheap. The population in Greenland is smaller than most American cities, at around 55,000 you won’t experience crowded shops or restaurants. Currently the only way to get to Greenland is by Air Greenland, a flight service from Baltimore Maryland to Greenland. There aren’t any roads here so you won’t need a vehicle. You better be prepared for very cold temperatures and not a lot of food options.Reindeer, whale, and seafood are the primary food sources. Vegetables and fruits are extremely expensive, but still somewhat available. If you want nutrition it’s best to simply bring vitamins and food bars that are fortified with extra vitamins and minerals. Remote Greenland is the world’s biggest island, and the sea that surrounds it is either permanently frozen or chilled by the mainly cold currents. In the centre of the country, ice can be up to 3km (2 miles) thick. It is no wonder that most of its population huddles around the ice-free coastal region. Indeed, the name ‘Greenland’ is itself a bit of a misnomer. Those wondering why anyone would want to inhabit such unforgiving terrain are ignorant of the beautiful sights that Greenland grants. The arctic nights in the winter concoct a wondrous continuous twilight and, in the far north of the country, complete darkness, coupled with the spectacular Northern Lights. However, Greenland has now become somewhat of a tourist attraction. It holds contests to attract tourists such as dog racing, ice fishing, hiking, and cross country racing. The northwest corner of Greenland is known as the Thule region. It is roughly the size of Germany, but inhabited by fewer than 1,000 people. The northern-most year-round communities on earth (Siorapaluk, Moriasaq and Qaanaaq) are in the Thule region. Siorapaluk, with approximately 80 residents, is just 730 nautical miles (1,360 km) from the North Pole. Currently, though most families in the Thule region need at least one member in salaried employment in order to pay for electricity and other modern amenities, hunting remains a revered profession. Traditional foods like seal, walrus, narwhal and caribou, are consumed frequently. Hunters still wear hand-made polar bear skin garments, caribou anoraks and skin boots for warmth on winter hunting trips. Many of the men maintain world-class kayaking and harpoon-throwing skills. A new report confirms high levels of heavy metals in traditional Greenlandic food. It is a challenge to substitute imported substandard foods with a more healthy diet, says the SLiCA Chief, Birger Poppel. People in Greenland are more exposed to contaminants from their diet than people in Europe and North America. The cause is that marine traditional food items such as fish, seabirds, seals and whales are much more important in Greenland, and that at the same time some of these food items contain high levels of heavy metals. Now, these well known facts from several sources are confirmed by at new report from the National Environmental Research Institute, NERI 1), in Denmark. The report presents contaminant data from muscle, liver, kidney and blubber from hooded seal and walrus and blubber and skin from minke whale. All samples were collected in West Greenland. Earlier research programs have showed that within the Arctic, Greenlanders have the highest concentrations of mercury and most organochlorines and estimated daily intakes of mercury, cadmium and several organochlorine compounds exceed “acceptable or tolerable daily intakes” for many people in Greenland. 1) By the way “neri” means eating in Greenlandic. Nepal, the fabled land of Buddha, Hindu temples, and unrivaled mountain scenery, was controlled by a myriad of factions since the 4th century. The modern Nepalese state began in the late 18th century when King Prithvi Narayah Shah successfully unified most of the individual ethnic groups and small principalities into one entity. In search of additional lands, Nepal ventured into India, subsequently losing part of its own territory to British India, but retaining its independence. Nepal, at the time, was controlled by a monarch (for life and by hereditary right), but in 1951, the Nepalese monarch (under great pressure) ended that system of rule, and instituted a cabinet system of government. Only one year after the country’s first election in 1959, King Kahendra dismissed the cabinet, dissolved parliament and banned political parties. Since 1990, turmoil and Nepal have traveled hand-in-hand, as a bloody insurgency, a royal family massacre and assorted governmental conflicts and squabbles have dominated the headlines. In early 2005 (once again) the king dissolved the government and assumed power. In this poor country, the tourism industry was once a significant economic force, as backpackers, river rafters, mountain climbers and nature lovers trekked to Nepal in large numbers. For the most part, the on-going fighting between the Maoist insurgency and government forces has devastated much of its worldwide tourism base, and yet, it remains on the front-burner of many adventure travelers, and certainly in the minds of all those who have previously ventured into Nepal. Nepal is a secular state under the Interim Constitution, which was promulgated on January 15, 2007. The Interim Constitution provides for freedom to practice one’s religion. The Interim Constitution also specifically denies the right to convert another person. The now-defunct constitution of 1990, which was in effect until January 15, 2007, described the country as a “Hindu Kingdom,” although it did not establish Hinduism as the state religion. The Government generally did not interfere with the practice of other religious groups, and religious tolerance was broadly observed; however, there were some restrictions. The Government took positive preliminary steps with respect to religious freedom during the period covered by this report, and government policy contributed to the generally free practice of religion. The Interim Parliament, through the Interim Constitution, officially declared the country a secular state in January 2007; however, no laws specifically affecting freedom of religion were changed. Nonetheless, many believed that the declaration made it easier to practice their religion freely. However, members of minority religious groups occasionally reported police harassment. 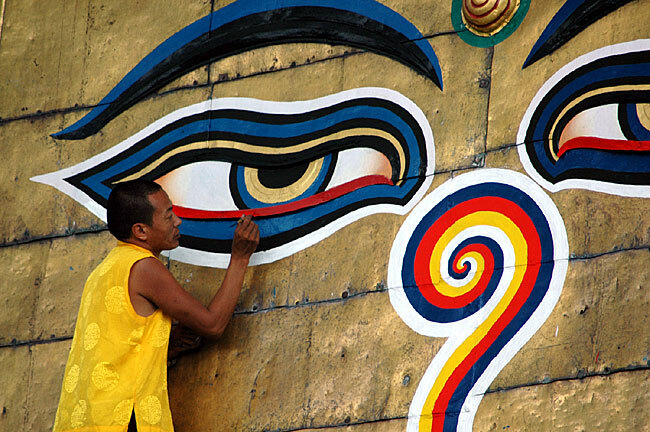 Authorities limited the location of and otherwise restricted many public celebrations by the Tibetan community, especially those with political overtones. Adherents of the country’s many religious groups generally coexisted peacefully and respected places of worship, although there were reports of societal abuses and discrimination based on religious belief or practice. Those who converted to another religious group at times faced violence and occasionally were ostracized socially but generally did not fear to admit their affiliations in public.